Borough Under 15s, wearing their Lynchwood Business Park sponsored kit, were big winners yesterday. Peterborough Rugby Club’s Under 15 team ran riot at Ely yesterday (April 7), notching up their biggest win since early November. 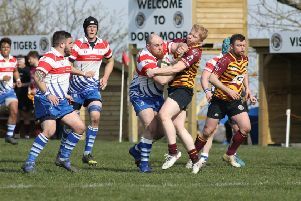 William Manning scored five tries as the team sponsored by Lynchwood Business Park won 55-7, with Ethan Manning scoring three and Louis Edwards getting the other. Lawrence Teague kicked five conversions. The Under 13 girls team brought more silverware back to the club as they overcame a slow start to win a festival staged by Premiership Northampton Saints at Franklin’s Gardens. After losing 5-10 against Towcester in their opening fixture, Borough recorded four straight wins to finish with the best playing record in the six-club competition. Livvy Buchanan led the scoring with eight tries as they beat Buckingham, Olney, Old Northamptonians and bogey club Kettering. Lucy Dangerfield and Ria Cardew had five tries apiece with single scores for Claudia Dugmore, Molly Rain and Poppy Murray.